Personal Ancestral File (PAF) was a free genealogy software program provided by FamilySearch, a website operated by The Church of Jesus Christ of Latter-day Saints. 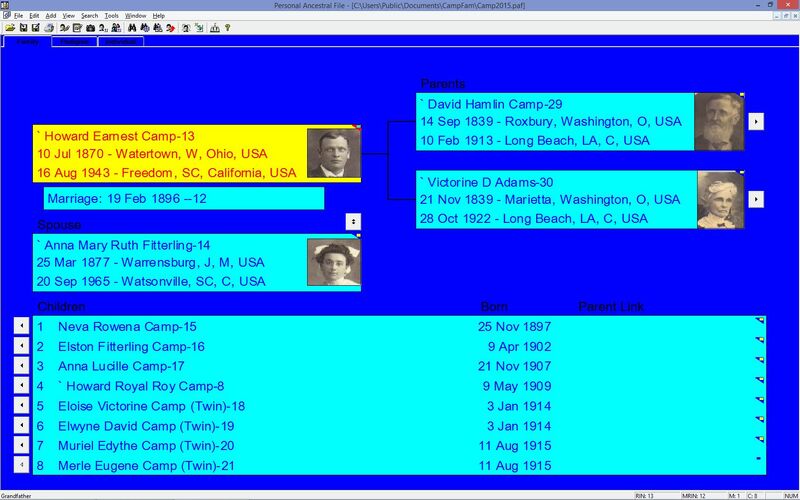 It allowed users to enter names, dates, citations and source information into a database, and sort and search the genealogical data, print forms and charts, and share files with others in GEDCOM format. PAF also linked images and other media files to individual records. What happened? After JULY 15, 2013, FamilySearch no longer offers PAF downloads or support. Why it happened? Advances in technology, strong alternatives from third parties, and the need to focus on the latest FamilySearch initiatives have diminished the need for PAF as part of the FamilySearch offering. How do you move to another software program? It’s easy. FamilySearch recommends that you choose one of the following free, third-party products that have each been certified to work with FamilySearch and the Family Tree. For those that still want PAF support – CampCo will provide that support for you – just ask. We can convert your PAF file into a GEDCOM and upload it for you to FamilySearch. We can run a comparison of the names in your PAF file and update those with your information into the FamilySearch Family Tree. If you need Help, Support, and Fixes with Personal Ancestral File – contact us by sending us a request at FamilyHistoryFree@gmail.com and we will do everything in our power to help you with your PAF problems.